Journal of Lightwave Technology. 2019-03-13. p. 1-1. Optics Letters. 2018-10-30. Vol. 43, num. 21, p. 5467. Optics Letters. 2018-09-17. Vol. 43, num. 19, p. 4574-4577. Nature Communications. 2018-07-31. Vol. 9, num. 1, p. 2990. Optics Express. 2018-06-13. Vol. 26, num. 13, p. 16505-16523. Optics Express. 2018-05-24. Vol. 26, num. 11, p. 14661-14677. D. Chow; J.-C. Beugnot; A. Godet; K. P. Huy; M. A. Soto Hernandez et al. Optics Letters. 2018-03-22. Vol. 43, num. 7, p. 1487. Z. Yang; M. A. Soto; D. Chow; P. Ray; L. Thevenaz et al. Journal of Lightwave Technology. 2018-03-01. Vol. 36, num. 5, p. 1239-1248. K. Hey Tow; D. M. Chow; F. Vollrath; I. Dicaire; T. Gheysens et al. Journal of Lightwave Technology. 2018-02-15. Vol. 36, num. 4, p. 1138-1144. Journal of Lightwave Technology. 2018-02-15. Vol. 36, num. 4, p. 961-967. Journal of Lightwave Technology. 2018. Vol. 36, num. 4, p. 1168-1177. 26th International Conference on Optical Fiber Sensors, OSA Technical Digest. 2018-11-21. 26th International Conference on Optical Fiber Sensors , Lausanne, Switzerland , 24–28 September 2018. p. ThE18. X. Sun; Z. Yang; X. Hong; S. Zaslawski; S. Wang et al. 26th International Conference on Optical Fiber Sensors, OSA Technical Digest. 2018-11-21. 26th International Conference on Optical Fiber Sensors , Lausanne, Switzerland , 24–28 September 2018. p. ThE102. S. Mikhailov; L. Zhang; T. Geernaert; F. Berghmans; K. H. Tow et al. 26th International Conference on Optical Fiber Sensors, OSA Technical Digest. 2018-11-21. 26th International Conference on Optical Fiber Sensors , Lausanne, Switzerland , 24–28 September 2018. p. ThE23. 26th International Conference on Optical Fiber Sensors, OSA Technical Digest. 2018-11-21. 26th International Conference on Optical Fiber Sensors , Lausanne, Switzerland , 24–28 September 2018. p. WF27. L. Szostkiewicz; Z. Yang; M. A. Soto; A. Dominguez-Lopez; A. Pytel et al. 26th International Conference on Optical Fiber Sensors, OSA Technical Digest. 2018-11-21. 26th International Conference on Optical Fiber Sensors , Lausanne, Switzerland , 24–28 September 2018. p. WC4. 26th International Conference on Optical Fiber Sensors, OSA Technical Digest. 2018-11-21. 26th International Conference on Optical Fiber Sensors , Lausanne, Switzerland , 24–28 September 2018. p. ThE17. L. Zhang; Z. Yang; Ł. Szostkiewicz; K. Markiewicz; T. Nasilowski et al. 26th International Conference on Optical Fiber Sensors, OSA Technical Digest. 2018-11-21. 26th International Conference on Optical Fiber Sensors , Lausanne, Switzerland , 24–28 September 2018. p. WF13. 26th International Conference on Optical Fiber Sensors, OSA Technical Digest. 2018-11-21. 26th International Conference on Optical Fiber Sensors , Lausanne, Switzerland , September 24–28, 2018. p. TuC4. 26th International Conference on Optical Fiber Sensors, OSA Technical Digest. 2018-11-21. 26th International Conference on Optical Fiber Sensors , Lausanne, Switzerland , September 24–28, 2018. p. ThE44. Proceedings of the 26th International Conference on Optical Fiber Sensors. 2018-11-21. 26th International Conference on Optical Fiber Sensors , SwissTech Convention Center, Lausanne, Switzerland , September 24-28, 2018. p. ThE27. F. Gyger; Z. Yang; M. A. Soto; F. Yang; K. Hey Tow et al. 26th International Conference on Optical Fiber Sensors, OSA Technical Digest . 2018-11-21. 26th International Conference on Optical Fiber Sensors , Lausanne, Switzerland , 24–28 September 2018. p. ThE69. 2018 IEEE 7th International Conference on Photonics (ICP). 2018-11-15. 2018 IEEE 7th International Conference on Photonics (ICP) , Langkawi, Malaysia , April 9-11, 2018. p. 1-3. Solid-State Lighting 2018. 2018-11-05. Light, Energy and the Environment 2018 (E2, FTS, HISE, SOLAR, SSL) , Singapore , November 5-8, 2018. p. ST4D.4. Light, Energy and the Environment 2018 . 2018-10-31. Optics and Photonics for Energy and the Environment 2018 , Singapore , 5-8 November 2018. p. EM2A.3. Proceedings 26th International Conference on Optical Fiber Sensors. 2018-09-27. 26th International Conference on Optical Fiber Sensors , Lausanne, Switzerland , 24–28 September 2018. p. ThE29. Specialty Optical Fibers 2018. 2018-07-02. Advanced Photonics 2018 , Zurich, Switzerland , 2-5 July 2018. p. SoW3H.1. Bragg Gratings, Photosensitivity and Poling in Glass Waveguides and Materials 2018. 2018-07-02. Advanced Photonics 2018 , Zurich, Switzerland , 2-5 July 2018. p. JTu2A.15. R. Matthey; B. Debord; K. Hey Tow; F. Yang; S. Schilt et al. 2018. 32nd European Frequency and Time Forum (EFTF 2018) , Torino, Italy , 10 -12 April 2018. K. Hey Tow; D. Chow; F. Vollrath; I. Dicaire; T. Gheysens et al. Proceedings of Optical Fiber Communication Conference 2018 (OFC 2018). 2018. Optical Fiber Communication Conference 2018 (OFC 2018) , San Diego, California, USA , 11–15 March 2018. M. A. Soto; A. Denisov; X. Angulo-Vinuesa; S. Martin-Lopez; L. Thévenaz et al. Optics Letters. 2017. Vol. 42, num. 13, p. 2539. Optics Express. 2017. Vol. 25, num. 14, p. 16059. CEAS Space Journal. 2017. Vol. 9, num. 4, p. 493–505. Optics Letters. 2017. Vol. 42, num. 10, p. 1903-1906. A. Garcia-Ruiz; J. Pastor-Graells; H. F. Martins; K. Hey Tow; L. Thévenaz et al. Optics Express. 2017. Vol. 25, num. 3, p. 1789. 2017. 2017 Conference on Lasers and Electro-Optics Europe & European Quantum Electronics Conference (CLEO/Europe-EQEC) , Munich, Germany , 25–29 June 2017. p. Paper CH_1_5. M. A. Soto; A. Denisov; X. Angulo-Vinuesa; S. Martin-Lopez; L. Thevenaz et al. 2017. 2017 Conference on Lasers and Electro-Optics Europe & European Quantum Electronics Conference (CLEO/Europe-EQEC) , Munich, Germany , 25–29 June 2017. p. Paper CI_P_1. P. Mergo; T. Nasilowski; B. Wajnchold; A. Pytel; A. Kolakowska et al. Technologies for Optical Countermeasures XIV. 2017. SPIE Security + Defence , Warsaw, Poland , 11-14 September 2017. p. 104350N. A. Garcia-Ruiz; J. Pastor-Graells; H. F. Martins; K. H. Tow; L. Thevenaz et al. 25th International Conference On Optical Fiber Sensors (OFS'25). 2017. 25th International Conference on Optical Fibre Sensors (OFS) , Jeju, Korea , April 24-28, 2017. p. 1032361. 2017. ICTON 2017 , Girona, Spain , 2-6, July, 2017. Proc. SPIE. 2017. 25th International Conference on Optical Fiber Sensors , Jeju, South Korea , April 24-28, 2017. p. 1032371. Proc. SPIE. 2017. 25th International Conference on Optical Fiber Sensors , Jeju, South Korea , April 24-28, 2017. p. 103239J. Proc. SPIE. 2017. 25th International Conference on Optical Fiber Sensors , Jeju, South Korea , April 24-28, 2017. p. 103230K. Proc. SPIE. 2017. 25th International Conference on Optical Fiber Sensors , Jeju, South Korea , April 24-28, 2017. p. 1032393. Proc. SPIE. 2017. 25th International Conference on Optical Fiber Sensors , Jeju, South Korea , April 24-28, 2017. p. 103238Z. Proc. SPIE. 2017. 25th International Conference on Optical Fiber Sensors , Jeju, South Korea , April 24-28, 2017. p. 103239L. Proceedings of the 25th International Conference on Optical Fiber Sensors. 2017. 25th International Conference on Optical Fiber Sensors , Jeju, Republic of Korea , April 24-28, 2017. Proc. SPIE. 2017. 25th International Conference on Optical Fiber Sensors , Jeju, Korea , April 24-28, 2017. p. 103230N. Optics Express. 2016. Vol. 24, num. 22, p. 25211-25223. A. Lopez-Gil; M. A. Soto; X. Angulo-Vinuesa; A. Dominguez-Lopez; S. Martin-Lopez et al. Optics Express. 2016. Vol. 24, num. 15, p. 17200-17214. Light: Science & Applications. 2016. Vol. 5, num. 5, p. e16074. A. Dominguez-Lopez; Z. Yang; M. A. Soto; X. Angulo-Vinuesa; S. Martin-Lopez et al. Optics Express. 2016. Vol. 24, num. 10, p. 10188-10204. Nature Communications. 2016. Vol. 7, p. 10870. Optics Express. 2016. Vol. 24, num. 1, p. 586-597. 2017 25Th International Conference On Optical Fiber Sensors (Ofs). 2016. 25th International Conference on Optical Fiber Sensors , Jeju, South Korea , April 24-28. p. UNSP 103231E. 2016. 21st Annual Symposium of the IEEE Photonics Benelux Chapter , Ghent, Belgium , November 17-18, 2016. Asia Pacific Optical Sensors Conference. 2016. Asia-Pacific Optical Sensors Conference , Shanghai , 2016. p. W4A.28. Asia Pacific Optical Sensors Conference. 2016. Asia-Pacific Optical Sensors Conference , Shanghai , 2016. p. Th3A.4. Asia Pacific Optical Sensors Conference. 2016. Asia-Pacific Optical Sensors Conference , Shanghai , 2016. p. Th3A.6. S. Schilt; K. Hey Tow; R. Mattey; M. Petersen; L. Thévenaz et al. Proceedings of the International Conference on Space Optics — ICSO 2016. 2016. International Conference on Space Optics 2016 , Biarritz, France , October 18-21, 2016. p. 105620I. 2016. 1st International Conference on Optics, Photonics & Materials, NICE OPTICS , Nice, France , October 26-28, 2016. OSA Technical Digest (online). 2016. Advanced Photonics 2016 (IPR, NOMA, Sensors, Networks, SPPCom, SOF) , Vancouver, Canada , 18–20 July 2016. p. paper SeM4D.4. Proc. of SPIE. 2016. 6th European Workshop on Optical Fibre Sensors , Limerick, Ireland , June 1-3, 2016. p. 99162F. Proc. SPIE. 2016. Sixth European Workshop on Optical Fibre Sensors , Limerick, Ireland , May 31-June 3, 2016. p. 991633. Proc. SPIE. 2016. Sixth European Workshop on Optical Fibre Sensors , Limerick, Ireland , May 31-June 3, 2016. p. 99162N. Proc. SPIE. 2016. Sixth European Workshop on Optical Fibre Sensors , Limerick, Ireland , May 31-June 3, 2016. p. 99162O. A. Lopez-Gil; X. Angulo-Vinuesa; M. A. Soto; A. Dominguez-Lopez; S. Martin-Lopez et al. Proc. SPIE 9916, Sixth European Workshop on Optical Fibre Sensors. 2016. Sixth European Workshop on Optical Fibre Sensors , Limerick, Ireland , May 31 - June 3, 2016. p. 991631. Proc. SPIE 9916, Sixth European Workshop on Optical Fibre Sensors. 2016. Sixth European Workshop on Optical Fibre Sensors , Limerick, Ireland , May 31 - June 3, 2016. p. 991635. Proc. SPIE 9916, Sixth European Workshop on Optical Fibre Sensors. 2016. Sixth European Workshop on Optical Fibre Sensors , Limerick, Ireland , May 31 - June 3, 2016. p. 99162A. Proceedings of 6th International Conference on Photonics (ICP2016). 2016. IEEE 6th International Conference on Photonics (ICP2016) , Kuching, Malaysia , March 14-16, 2016. Optical Fiber Communication Conference. 2016. Optical Fiber Communication Conference , Anaheim, California , March 20-22, 2016. p. M2D.5. Asia-Pacific Optical Sensors Conference, Shanghai, October 11-14, 2016. Optics Express. 2015. Vol. 23, num. 23, p. 29514-29532. Optics Express. 2015. Vol. 23, num. 19, p. 24923-24926. Proceedings of the 20th OptoElectronics and Communications Conference (OECC2015). 2015. 2015 Opto-Electronics and Communications Conference (OECC) , Shanghai, PR China , June 28 - July 2, 2015. p. Paper JWeB.23. D. M. Chow; K. H. Tow; F. Vollrath; I. Dicaire; T. Gheysens et al. IEEE Photonics Conference (IPC) 2015. 2015. IEEE Photonics Conference (IPC) 2015 , Reston, VA, USA , 4-8 October 2015. p. 333-334. IEEE Photonics Conference (IPC) 2015. 2015. IEEE Photonics Conference (IPC) 2015 , Reston, VA, USA , 4-8 October 2015. p. 337-338. M. Alem; M. A. Soto; L. Thévenaz; J. Urricelqui; M. Sagues et al. 2015 Spatiotemporal Complexity in Nonlinear Optics (SCNO). 2015. 2015 Spatiotemporal Complexity in Nonlinear Optics (SCNO) , Como, Italy , 31 August - 4 September 2015. p. 1-2. Proceedings OWTNM'2015. 2015. XXIII International Workshop on Optical wave and waveguide theory and numerical modelling (OWTNM 2015) , City University London, UK , April 17-18, 2015. p. 68. A. Dominguez-Lopez; Z. Yang; M. A. Soto Hernandez; X. Angulo-Vinuesa; S. Martin-Lopez et al. Proc. SPIE. 2015. 24th International Conference on Optical Fibre Sensors , Cutitiba, Brazil , September 28-October 2, 2015. p. 96342E. Proc. SPIE. 2015. 24th International Conference on Optical Fibre Sensors , Cutitiba, Brazil , September 28-October 2, 2015. p. 96340J. Proc. SPIE. 2015. 24th International Conference on Optical Fibre Sensors , Cutitiba, Brazil , September 28-October 2, 2015. p. 963434. J. Urricelqui; M. Alem; M. Sagues; L. Thévenaz; A. Loayssa et al. Proc. SPIE. 2015. 24th International Conference on Optical Fibre Sensors , Cutitiba, Brazil , September 28-October 2, 2015. p. 963433. Proc. SPIE. 2015. 24th International Conference on Optical Fibre Sensors , Cutitiba, Brazil , September 28-October 2, 2015. p. 96342D. Proc. SPIE. 2015. 24th International Conference on Optical Fibre Sensors , Cutitiba, Brazil , September 28-October 2, 2015. p. 96341D. Proc. SPIE. 2015. 24th International Conference on Optical Fibre Sensors , Cutitiba, Brazil , September 28-October 2, 2015. p. 96347D. D. Chow; J. C. Tchahame Nougnihi; A. Denisov; J.-C. Beugnot; T. Sylvestre et al. Frontiers in Optics 2015. 2015. Frontiers in Optics , San Jose, California , October 18, 2015. p. FW4F.4. 2015. International OSA Networks of Students (IONS) , Karlsruhe, Germany , June 26-29, 2015. Nature Photonics. 2015. Vol. 9, num. 3, p. 144-146. Stanford Photonics Research Center Annual Symposium 2015, Stanford University, USA, September 14, 2015. T. Schneider; C.-s. Brès; L. Thévenaz; M. A. Soto Hernandez; M. M. Alem Karladani et al. T. Schneider; C. S. Brès; L. Thévenaz; M. A. Soto Hernandez; M. Alem et al. M. A. Soto; A. L. Ricchiuti; L. Zhang; D. Barrera; S. Sales et al. Optics Express. 2014. Vol. 22, num. 23, p. 28584-28595. IEEE Photonics Technology Letters. 2014. Vol. 26, num. 20, p. 2039-2042. F. Alishahi; A. Vedadi; T. M. P. Hoang; M. A. Soto; A. Denisov et al. Optics Letters. 2014. Vol. 39, num. 21, p. 6114. M. A. Soto; X. Angulo-Vinuesa; S. Martin-Lopez; S.-H. Chin; J. D. Ania-Castanon et al. Journal of Lightwave Technology. 2014. Vol. 32, num. 1, p. 152-162. 2014. 9th European Space Agency (ESA) Round Table on Micro and Nano Technologies for Space Application , Lausanne, Switzerland , June 10-13, 2014. 2014. FLAIR-2014, Field Laser Applications in Industry and Research Conference , Florence , May 5-9, 2014. 2014 Ieee Haptics Symposium (Haptics). 2014. IEEE Haptics Symposium (HAPTICS) , Houston, TX , FEB 23-26, 2014. p. 75-81. 2014 IEEE 5th International Conference on Photonics (ICP). 2014. 2014 IEEE 5th International Conference on Photonics (ICP) , Kuala Lumpur, Malaysia , 2-4 September 2014. p. 47-52. 2014 The European Conference on Optical Communication (ECOC). 2014. 2014 European Conference on Optical Communication (ECOC) , Cannes, France , 21-25 September 2014. p. 1-3. IEEE SENSORS 2014 Proceedings. 2014. 2014 IEEE Sensors , Valencia, Spain , November 2-5, 2014. p. 146-149. Asia Communications and Photonics Conference 2014. 2014. Asia Communications and Photonics Conference , Shanghai , November 11-14, 2014. p. ATh2C.4. J. Hervás Peralta; A. Ricchiuti; D. Barrera; S. Sales; L. Thévenaz et al. Advanced Photonics. 2014. Optical Sensors , Barcelona , 2014. p. SeW1C.2. C. S. Brès; M. A. Soto; M. Alem; M. A. Shoaie; A. Vedadi et al. 2014 16th International Conference on Transparent Optical Networks (ICTON). 2014. 2014 16th International Conference on Transparent Optical Networks (ICTON) , Graz, Austria , 6-10 July 2014. p. 1-4.
International Photonics and OptoElectronics Meetings. 2014. The 7th International Photonics and OptoElectronics Meetings , Wuhan, China , June 18-21, 2014. p. FTh4D.1. Proc. SPIE. 2014. 23rd International Conference on Optical Fibre Sensors , Santander, Spain , June 2-6, 2014. p. 91576Q. Proc. SPIE. 2014. 23rd International Conference on Optical Fibre Sensors , Santander, Spain , June 2-6, 2014. p. 9157AO. Proceedings of SPIE. 2014. 23rd International Conference on Optical Fibre Sensors , Santander, Spain , June 2-6, 2014. p. 91576W. Proceedings of SPIE. 2014. 23rd International Conference on Optical Fibre Sensors , Santander, Spain , June 2-6, 2014. p. 9157AN. F. Alishahi; A. Vedadi; M. A. Shoaie; M. A. Soto; A. Denisov et al. CLEO: 2014. 2014. CLEO: Science and Innovations , San Jose, California, United States , June 8-13, 2014. p. STu3N.4. M. A. Soto; A. Lavinia Ricchiuti; L. Zhang; D. Barrera; S. Sales et al. Proceedings of SPIE. 2014. 23rd International Conference on Optical Fibre Sensors , Santander, Spain , June 2-6, 2014. p. 91575T. Proceedings of SPIE. 2014. 23rd International Conference on Optical Fibre Sensors , Santander, Spain , June 2-6, 2014. p. 91575S. Proc. SPIE. 2014. 23rd International Conference on Optical Fibre Sensors , Santander, Spain , June 2-6, 2014. p. 9157D2. Proceedings of SPIE. 2014. 23rd International Conference on Optical Fibre Sensors , Santander, Spain , June 2-6, 2014. p. 9157C3. Proceedings of SPIE. 2014. 23rd International Conference on Optical Fibre Sensors , Santander, Spain , June 2-6, 2014. p. 91573R. F. Alishahi; A. Vedadi; M. A. Soto; A. Denisov; K. Mehrany et al. Optical Fiber Communication Conference. 2014. Optical Fiber Communication Conference , San Francisco, California , 2014. p. Th1H.4. Asia Communications and Photonics Conference 2014, Shanghai, China, November 11, 2014. Optics Express. 2013. Vol. 21, num. 25, p. 31347-31366. M. A. Soto; M. Alem; M. A. Shoaie; A. Vedadi; C. S. Brès et al. Nature Communications. 2013. Vol. 4, p. 2898. Optics Express. 2013. Vol. 21, num. 23, p. 28175-28181. C. Porzi; S. Chin; A. Trita; F. Fresi; G. Berrettini et al. Journal of Lightwave Technology. 2013. Vol. 31, num. 17, p. 2888-2896. Journal of Microelectromechanical Systems. 2013. Vol. 22, num. 4, p. 884-891. Optics Express. 2013. Vol. 21, num. 14, p. 16390. Optics Express. 2013. Vol. 21, num. 12, p. 14017-14035. Nature Scientific Reports. 2013. Vol. 3, p. 01594. Optics Express. 2013. Vol. 21, num. 6, p. 7171-7179. OSA Technical Digest (online). 2013. Asia Communications and Photonics Conference 2013 Postdeadline , Beijing China , November 12-15, 2013. p. paper AF2E.6. Frontiers in Optics 2013, OSA Technical Digest (online) (Optical Society of America, 2013). 2013. Frontiers in Optics , Orlando, Florida, USA , October 6-10, 2013. p. paper FW4I.3. F. Alishahi; A. Vedadi; A. Denisov; M. A. Soto; K. Mehrany et al. European Conference on Lasers and Electro-Optics (CLEO-Europe). 2013. European Conference on Lasers and Electro-Optics (CLEO-Europe) , Munich, Germany , May 12-16, 2013. M. A. Soto; M. Alem; M. A. Shoaie; A. Vedadi; C.-S. Brès et al. Advanced Photonics 2013. 2013. Signal Processing in Photonic Communications , Rio Grande, Puerto Rico , July 14-17, 2013. p. SPT2D.6. Proc. SPIE 8794. Fifth European Workshop on Optical Fibre Sensors. 2013. Fifth European Workshop on Optical Fibre Sensors , Krakow, Poland , May, 2013. Fifth European Workshop on Optical Fibre Sensors. 2013. Fifth European Workshop on Optical Fibre Sensors , Krakow, Poland , May, 2013. T. Schneider; M. A. Soto; M. Alem; M. A. Shoaie; L. Thévenaz et al. Photonic Networks, 14. 2013 ITG Symposium. Proceedings. 2013. Photonic Networks, 14. 2013 ITG Symposium , Leipzig, Germany , 6-7 May 2013. p. 1-5. M. A. Soto; M. Alem; M. A. Shoaie; A. Vedadi; L. Thévenaz et al. OSA Technical Digest. 2013. CLEO Conference , San Jose, USA , June 9-14. 2013. CLEO: 2013 Technical Digest. 2013. CLEO Conference , San Jose, USA , June 9-14, 2013. p. CF1E.5. Optics Letters. 2012. Vol. 37, num. 23, p. 4934-4936. Optics Letters. 2012. Vol. 37, num. 15, p. 3171-3173. A. Zadok; Y. Antman; N. Primerov; A. Denisov; J. Sancho et al. Laser & Photonics Reviews. 2012. Vol. 6, num. 5, p. L1–L5. doi: 10.1002/lpor.201200013. Optics Express. 2012. Vol. 20, num. 7, p. 7807. X. Angulo-Vinuesa; S. Martin-Lopez; J. Nuno; P. Corredera; J. D. Ania-Castanon et al. Journal of Lightwave Technology. 2012. Vol. 30, num. 8, p. 1060-1065. J. Sancho; N. Primerov; S. Chin; Y. Antman; A. Zadok et al. Optics Express. 2012. Vol. 20, num. 6, p. 6157-6162. M. W. Lee; B. Stiller; J. Hauden; H. Maillotte; C. Roch et al. IEEE Photonics Technology Letters. 2012. Vol. 24, num. 1, p. 79-81. IEEE Sensors Journal. 2012. Vol. 12, num. 1, p. 189-194. M. Santagiustina; L. Ursini; A. Galtarossa; F. Chiarello; L. Palmieri et al. Proceedings Fotonica 2012, 14° Convegno Nazionale delle Tecnologie Fotoniche. 2012. Fotonica 2012, 14° Convegno Nazionale delle Tecnologie Fotoniche , Firenze, Italy , May 15–17, 2012. p. Paper B3.4. L. Thévenaz; N. Primerov; S. Chin; Y. Antman; A. Denisov et al. IEEE 3rd International Conference on Photonics 2012. 2012. IEEE 3rd International Conference on Photonics (ICP 2012) , Penang, Malaysia , 1-3 October 2012. p. 1-5. J. Sancho; J. Lloret; N. Primerov; S. Sales; L. Thévenaz et al. 2012 14th International Conference on Transparent Optical Networks (ICTON). 2012. 2012 14th International Conference on Transparent Optical Networks (ICTON) , Coventry, United Kingdom , July 2-5, 2012. p. 1-4. OFS2012 22nd International Conference on Optical Fiber Sensors. 2012. OFS2012 22nd International Conference on Optical Fiber Sensors , Beijing, China , October 15-19, 2012. p. 842116. OFS2012 22nd International Conference on Optical Fiber Sensors. 2012. OFS2012 22nd International Conference on Optical Fiber Sensors , Beijing, China , October 15-19, 2012. p. 84211K. X. Angulo-Vinuesa; M. A. Soto; S. Martin-Lopez; S. Chin; J. D. Ania-Castanon et al. Proc. SPIE 8421. 2012. OFS2012 22nd International Conference on Optical Fiber Sensors , Beijing, China , 15-19 October 2012. Proc. SPIE 8421. 2012. OFS2012 22nd International Conference on Optical Fiber Sensors , Beijing, China , 15-19 October 2012. p. 8421A7. H. Maillotte; J.-C. Beugnot; B. Stiller; M. W. Lee; D. M. Nguyen et al. 2012 17th Opto-Electronics and Communications Conference. 2012. 2012 Opto-Electronics and Communications Conference (OECC) , Busan, Korea (South) , 2-6 07 2012. p. 186-187. Optical Sensing And Detection Ii. 2012. Conference on Optical Sensing and Detection II , Brussels, BELGIUM , Apr 16-19, 2012. p. -. OSA Technical Digest (online). 2012. Optical Sensors , Monterey, California USA , June 25-28, 2012. p. paper STu2F.1. 2012. IONS-11 , Paris, France , February 22-25, 2012. Proceedings of SPIE - The International Society for Optical Engineering. 2012. Photonics Europe - Optical Sensing and Detection II , Brussels, Belgium , April 16, 2012. p. 843908. OSA Technical Digest. 2012. Optical Fiber Communication Conference (OFC) , Los Angeles, California , March 4, 2012. p. JW2A.24. Proc. SPIE. 2012. Photonics West - Advances in Slow and Fast Light V , San Francisco, California, USA , 22 January 2012. p. 82731D. Proc. SPIE. 2012. Photonics West - Advances in Slow and Fast Light V , San Francisco, California, USA , 22 January 2012. p. 82730C. X. Angulo-Vinuesa; S. Martin-Lopez; C. Caucheteur; D. Kinet; M. Wuilpart et al. Proc. SPIE. 2012. Photonics West - Advances in Slow and Fast Light V , San Francisco, California, USA , 22 January 2012. p. 827310. M. Santagiustina; G. Eisenstein; L. Thévenaz; J. Capmany; J. Mork et al. IEEE Photonics Society Newsletter. 2012. Vol. 26, num. 1, p. 5-12. Laser & Photonics Reviews. 2012. Vol. 6, num. 6, p. 724–738. 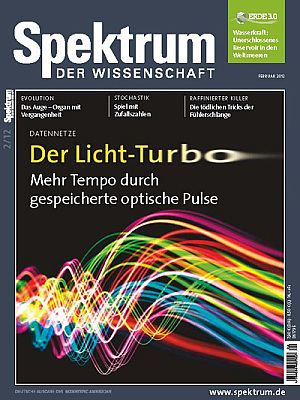 Spektrum der Wissenschaft. 2012. num. 02, p. 48-56. Z. Shmilovitch; N. Primerov; A. Zadok; A. Eyal; S. Chin et al. Optics Express. 2011. Vol. 19, num. 27, p. 25873-25880. R. Pant; C. G. Poulton; D.-Y. Choi; H. Mcfarlane; S. Hile et al. Optics Express. 2011. Vol. 19, num. 9, p. 8285-8290. Optics Express. 2011. Vol. 19, num. 8, p. 7381-7397. Optics Letters. 2011. Vol. 36, num. 2, p. 97. OSA Technical Digest. 2011. Frontiers in Optics , San Jose, California , October 16, 2011. p. paper FThF1. M. W. Lee; B. Stiller; J. Hauden; H. Maillotte; L. Thévenaz et al. European Conference on Optical Communication, ECOC. 2011. 37th European Conference and Exposition on Optical Communications (ECOC) , Geneva, Switzerland , 18-22 Sept. 2011. p. Tu.6.LeCervin.2. European Conference on Optical Communication, ECOC. 2011. 37th European Conference and Exposition on Optical Communications (ECOC) , Geneva, Switzerland , 18-22 Sept. 2011. p. Tu.5.LeCervin.5. IEEE Photonic Society 24th Annual Meeting. 2011. 2011 IEEE Photonics Conference (IPC) , Arlington, VA, USA , 9-13 October 2011. p. 63-64. 2011 Conference on Lasers and Electro-Optics Europe and 12th European Quantum Electronics Conference (CLEO EUROPE/EQEC). 2011. 12th European Quantum Electronics Conference CLEO EUROPE/EQEC , Munich, Germany , 22-26 05 2011. p. CD_P8. M. Gonzalez-Herraez; S. Martin-Lopez; M. Alcon-Camas; P. Corredera; L. Thévenaz et al. 2011 Conference on Lasers and Electro-Optics Europe and 12th European Quantum Electronics Conference (CLEO EUROPE/EQEC). 2011. 12th European Quantum Electronics Conference CLEO EUROPE/EQEC , Munich, Germany , 22-26 05 2011. p. CH6_1. R. Pant; C. Poulton; H. MacFarlane; L. Thévenaz; D.-Y. Choi et al. OSA Technical Digest (CD). 2011. Conference on Lasers and Electro-Optics (CLEO), 2011 , Baltimore, Maryland , 1-6 May 2011. p. CTuX5. OSA Technical Digest (CD). 2011. Slow and Fast Light (SL) , Toronto, Canada , June 12, 2011. p. SLWC2. OSA Technical Digest (CD). 2011. Slow and Fast Light (SL) , Toronto, Canada , June 12, 2011. p. SLMA2. OSA Technical Digest (CD). 2011. Slow and Fast Light (SL) , Toronto, Canada , June 12, 2011. p. SLMC6. OSA Technical Digest (CD). 2011. Slow and Fast Light (SL) , Toronto, Canada , June 12, 2011. p. SLMA3. OSA Technical Digest (CD). 2011. Slow and Fast Light (SL) , Toronto, Canada , June 12, 2011. p. SLWB4. C. Porzi; S. H. Chin; A. Trita; F. Fresi; G. Berrettini et al. OSA Technical Digest (CD). 2011. Optical Fiber Communication Conference and Exposition (OFC/NFOEC), 2011 and the National Fiber Optic Engineers Conference , Los Angeles, California , 6-10 March 2011 . p. JWA046. J. D. Ania-Castanon; S. Martin-Lopez; M. Alcon-Camas; F. Rodriguez-Barrios; A. Carrasco-Sanz et al. IEEE Winter Topicals 2011. 2011. 2011 IEEE Winter Topicals (WTM) , Keystone, CO, USA , 10-12 01 2011. p. 167-168. Proc. SPIE. 2011. 21st International Conference on Optical Fiber Sensors , Ottawa, Canada , May 15-19, 2011. p. 7753A5. Proc. SPIE. 2011. 21st International Conference on Optical Fiber Sensors , Ottawa, Canada , May 15-19, 2011. p. 77539V. Proc. SPIE. 2011. 21st International Conference on Optical Fiber Sensors , Ottawa, Canada , May 15-19, 2011. p. 775322. Z. Shmilovich; A. Eyal; M. Tur; A. Zadok; N. Primerov et al. Proc. SPIE. 2011. 21st International Conference on Optical Fiber Sensors , Ottawa, Canada , May 15-19, 2011. p. 77532D. Proc. SPIE. 2011. 21st International Conference on Optical Fiber Sensors , Ottawa, Canada , May 15-19, 2011. p. 775309. L. Thévenaz; S. H. Chin; P. Berger; J. Bourderionnet; S. Sales et al. Proc. SPIE. 2011. Photonics West - Advances in Slow and Fast Light IV , San Francisco, California, USA , 23 January 2011. p. 79490B. Proceedings SPIE. 2011. Photonics West - Advances in Slow and Fast Light IV , San Francisco, California, USA , 23 January 2011. p. 79491B. Proceedings SPIE. 2011. Photonics West - Advances in Slow and Fast Light IV , San Francisco, California, USA , 23 January 2011. p. 79490A. Bulletin SEV/AES. 2011. num. 8, p. 32-36. F. Berghmans; J. Dudley; S. Février; T. Geernaert; G. Gentry et al. Lausanne, Switzerland: EPFL Press, distributed by CRC Press. 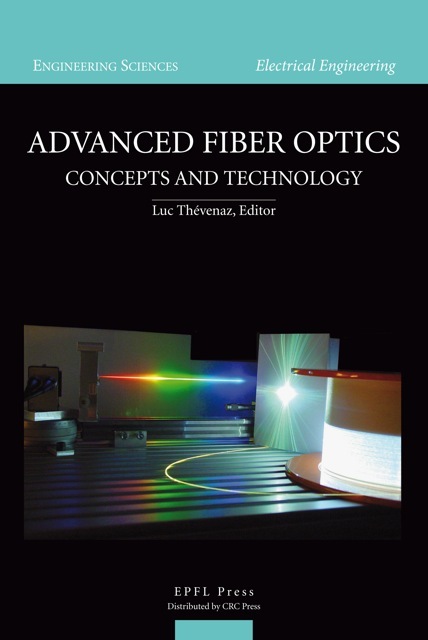 Advanced Fiber Optics - Concepts and Technology; Lausanne, Switzerland: EPFL Press, distributed by CRC Press, 2011. p. 263-307. J. Sancho; S. Chin; M. Sagues; A. Loayssa; J. Lloret et al. IEEE Photonics Technology Letters. 2010. Vol. 22, num. 23, p. 1753-1755. S. Chin; L. Thévenaz; J. Sancho; S. Sales; J. Capmany et al. Optics Express. 2010. Vol. 18, num. 21, p. 22599. Journal of Lightwave Technology. 2010. Vol. 28, num. 20, p. 2993-3003. B. Stiller; S. M. Foaleng; J.-C. Beugnot; M. W. Lee; M. Delqué et al. Optics Express. 2010. Vol. 18, num. 19, p. 20136. Applied Optics. 2010. Vol. 49, num. 24, p. 4604-4609. S. Martin-Lopez; M. Alcon-Camas; F. Rodriguez; P. Corredera; J. D. Ania-Castañon et al. Optics Express. 2010. Vol. 18, num. 18, p. 18769. Measurement Science and Technology. 2010. Vol. 21, num. 9, p. 094024. F. Rodriguez-Barrios; S. Martin-Lopez; A. Carrasco-Sanz; P. Corredera; J. D. Ania-Castan et al. Journal of Lightwave Technology. 2010. Vol. 28, num. 15, p. 2162-2172. Journal of Lightwave Technology. 2010. Vol. 28, num. 14, p. 2062-2067. Optics Express. 2010. Vol. 18, num. 8, p. 8671-8679. Optics Express. 2010. Vol. 18, num. 8, p. 8053. Opt. Lett.. 2010. Vol. 35, num. 2, p. 259-261. S. Chin; N. Primerov; K. Y. Song; L. Thévenaz; M. Santagiustina et al. Proceedings of the XVIII Riunione Nazionale di Elettromagnetismo - RiNEm. 2010. XVIII Riunione Nazionale di Elettromagnetismo - RiNEm , Benevento, Italy , September 6-10, 2010. p. opt15. R. Pant; C. Poulton; H. McFarlane; L. Thévenaz; D.-Y. Choi et al. 35th Australian Conference on Optical Fibre Technology, ACOFT 2010. 2010. 35th Australian Conference on Optical Fibre Technology , Melbourne, Australia , 5-9 Dec. 2010. 2010 IEEE International Topical Meeting on Microwave Photonics. 2010. 2010 IEEE Topical Meeting on Microwave Photonics (MWP 2010) , Montreal, QC, Canada , 5-9 October 2010. p. 385-388. S. Martin Lopez; F. Rodriguez Barrios; A. Carrasco Sanz; P. Corredera; A. Castañon et al. Proc. SPIE. 2010. Fourth European Workshop on Optical Fibre Sensors , Porto, Portugal , September 8, 2010. p. 76532T. Proc. SPIE. 2010. Fourth European Workshop on Optical Fibre Sensors , Porto, Portugal , September 8, 2010. p. 76530L. Proc. SPIE. 2010. Fourth European Workshop on Optical Fibre Sensors , Porto, Portugal , September 8, 2010. p. 76532U. L. Thévenaz; S. Foaleng Mafang; K.-Y. Song; S. H. Chin; J.-C. Beugnot et al. Proc. SPIE. 2010. Fourth European Workshop on Optical Fibre Sensors , Porto, Portugal , September 8, 2010. p. 765309. J.-C. Beugnot; B. Stiller; S. M. Foaleng; M. W. Lee; M. Delque et al. 36th European Conference and Exhibition on Optical Communication. 2010. 2010 36th European Conference and Exhibition on Optical Communication - (ECOC 2010) , Torino, Italy , 19-23 09 2010. p. 1-3. L. Thévenaz; S. M. Foaleng; K.-Y. Song; S. Chin; N. Primerov et al. 36th European Conference and Exhibition on Optical Communication. 2010. 36th European Conference and Exhibition on Optical Communication - (ECOC 2010) , Torino, Italy , 19-23 09 2010. p. 1-6. 15th OptoElectronics and Communication Conference. 2010. 15th OptoElectronics and Communication Conference , Sapporo, Japan , 5-9 July 2010. p. 482-483. B. Stiller; J.-C. Beugnot; S. F. Mafang; M. W. Lee; M. Delque et al. IEEE Photonics Society Summer Topicals 2010. 2010. 2010 IEEE Photonics Society Summer Topical Meeting Series , Playa del Carmen, Mexico , 19-21 07 2010. p. 168-169. F. Rodríguez-Barrios; S. Martín-López; A. Carrasco-Sanz; P. Corredera; J. D. Ania-Castañón et al. OSA Technical Digest (CD). 2010. Optical Sensors , Karlsruhe, Germany , June 21, 2010. S. H. Chin; N. Primerov; K.-Y. Song; L. Thévenaz; M. Santagiustina et al. OSA Technical Digest (CD) . 2010. Nonlinear Photonics (NP) , Karlsruhe, Germany , June 21, 2010. B. Stiller; M. Delqué; M. W. Lee; F. S. M.; J.-C. Beugnot et al. Proceedings of SPIE - The International Society for Optical Engineering. 2010. Photonics Europe 2010 , Brussels, Belgium , 14 April 2010 . p. null. Optical Fiber Communication Conference, OSA Technical Digest. 2010. Optical Fiber Communication Conference (OFC) , San Diego, California, USA , March 21, 2010. p. paper OWF6. Frontiers of Optoelectronics in China. 2010. Vol. 3, num. 1, p. 13-21. 29ème Journées Nationales d'Optique Guidée, Besançon, France, October 22, 2010. 3rd International Forum on Opto-Electronic Sensor-Based Monitoring in Geo-Engineering, Suzhou, China, September 29-30, 2010. Comptes Rendus Physique. 2009. Vol. 10, num. 10, p. 1008-1013. Opt. Express. 2009. Vol. 17, num. 24, p. 21910-21917. A. Zadok; S. Chin; L. Thévenaz; E. Zilka; A. Eyal et al. Opt. Lett.. 2009. Vol. 34, num. 16, p. 2530-2532. Optics Express. 2009. Vol. 17, num. 6, p. 4732-4739. Optics Letters. 2009. Vol. 34, num. 6, p. 707-709. Recueil des communications JNOG'2009. 2009. Journée Nationale d'Optique Guidée JNOG 2009 , Lille, France , July 6-9, 2009. p. 86-88. L. Thévenaz; S. Chin; I. Dicaire; J.-C. Beugnot; S. Foaleng Mafang et al. Proceedings of SPIE. 2009. 20th International Conference on Optical Fibre Sensors , Edinburgh, United Kingdom , October 5, 2009. p. 75034W-4. 35th European Conference on Optical Communication - Post Deadline Papers. 2009. 35th European Conference on Optical Communication ECOC '09 , Vienna, Austria , Sept. 20-24, 2009. p. 1-2. Proceedings of the 20th International Conference on Optical Fibre Sensors. 2009. 20th International Conference on Optical Fibre Sensors , Edinburgh, United Kingdom , October 5, 2009. p. 75037V-4. Proceedings of the 20th International Conference on Optical Fibre Sensors. 2009. 20th International Conference on Optical Fibre Sensors , Edinburgh, United Kingdom , October 5, 2009. p. 75032C-4. Proceedings of the 20th International Conference on Optical Fibre Sensors. 2009. 20th International Conference on Optical Fibre Sensors , Edinburgh, United Kingdom , October 5, 2009. p. 750369-4. Proceedings of the 20th International Conference on Optical Fibre Sensors. 2009. 20th International Conference on Optical Fibre Sensors , Edinburgh, United Kingdom , October 5, 2009. p. 750383-4. M. Iten; A. M. Puzrin; D. Hauswirth; S. Foaleng-Mafang; J.-C. Beugnot et al. Proceedings of the 20th International Conference on Optical Fibre Sensors. 2009. 20th International Conference on Optical Fibre Sensors , Edinburgh, United Kingdom , October 5, 2009. p. 75037S-4. W. R. Habel; I. Baumann; F. Berghmans; K. Borzycki; C. Chojetzki et al. Proceedings of the 20th International Conference on Optical Fibre Sensors. 2009. 20th International Conference on Optical Fibre Sensors , Edinburgh, United Kingdom , October 5, 2009. p. 75035E-4. Proceedings of the 20th International Conference on Optical Fibre Sensors. 2009. 20th International Conference on Optical Fibre Sensors , Edinburgh, United Kingdom , October 5, 2009. p. 75036A-4. Conference on Lasers and Electro-Optics/International Quantum Electronics Conference, OSA Technical Digest (CD). 2009. Conference on Lasers and Electro-Optics/International Quantum Electronics Conference , Baltimore, MD , May 31, 2009 - June 5, 2009. p. JTuE1. Slow and Fast Light Topical Meeting OSA Technical Digest (CD). 2009. Slow and Fast Light , Waikiki HI, USA . p. SMC2. Asia Communications and Photonics Conference and Exhibition Technical Digest (CD). 2009. Asia Communications and Photonics Conference and Exhibition , Shanghai, China , November 2-6, 2009. p. TuA3. Optical Fiber Communication Conference. 2009. p. OMP4. Conference on Lasers and Electro-Optics/International Quantum Electronics Conference. 2009. Conference on Lasers and Electro-Optics/International Quantum Electronics Conference , Baltimore, Maryland , May 31, 2009 - June 5, 2009. p. JTuB2. A. Zadok; S. Chin; E. Zilka; A. Eyal; L. Thévenaz et al. Slow and Fast Light. 2009. p. PDPC1. International Conference on Materials for Advanced Technologies. 2009. International Conference on Materials for Advanced Technologies , Singapore , June 28-July 3, 2009. p. P-S4.3. Photonics Europe. 2009. Prague , April, 2009. p. 73570U. Slow and Fast Light. 2009. p. JWB2. S. Chin; I. Dicaire; J.-C. Beugnot; S. Foaleng-Mafang; M. Gonzalez-Herraez et al. Slow and Fast Light. 2009. p. SMA3. Proceedings Photonics West. 2009. Photonics West - Advances in Slow and Fast Light II , San Jose, CA, USA , January 25-29, 2009. p. 72260C. Opt. Express. 2008. Vol. 16, num. 26, p. 21692-21707. S. Schilt; R. Matthey; D. Kauffmann-Werner; C. Affolderbach; G. Mileti et al. Appl. Opt.. 2008. Vol. 47, num. 24, p. 4336-4344. IEEE Sensors Journal. 2008. Vol. 8, num. 7, p. 1268-1272. Opt. Express. 2008. Vol. 16, num. 16, p. 12181-12189. Applied Physics B: Lasers and Optics. 2008. Vol. 90, num. 2, p. 191-196. 2008 10th Anniversary International Conference on Transparent Optical Networks. 2008. 2008 10th Anniversary International Conference on Transparent Optical Networks (ICTON 2008) , Athens, Greece , 22-26 06 2008. p. 75-80. 19Th International Conference On Optical Fibre Sensors, Pts 1 And 2. 2008. 19th International Conference on Optical Fibre Sensors , Perth, AUSTRALIA , Apr 15-18, 2008. p. N43-N43. 2008 International Conference on Optical Instruments and Technology. 2008. 2008 International Conference on Optical Instruments and Technology: Optoelectronic Measurement Technology and Applications , Beijing, China , 2008. p. 716013. Optical Fiber Communication Conference/National Fiber Optic Engineers Conferencer Optic Engineers Conference. 2008. Optical Fiber Communication Conference , San Diego, California United States , February 24-28, 2008. p. Paper OML7. 19th International Conference on Optical Fibre Sensors. 2008. 19th International Conference on Optical Fibre Sensors , Perth, AUSTRALIA , Apr 15-18, 2008. p. N43-N43. Slow and Fast Light. 2008. p. paper STuC5. 19th International Conference on Optical Fibre Sensors. 2008. p. 70044J-4. 19th International Conference on Optical Fibre Sensors. 2008. p. 70046L-4. Slow and Fast Light. 2008. p. Paper SMC3. Slow and Fast Light. 2008. p. Paper JMB10. Nature Photonics. 2008. Vol. 2, num. 8, p. 474-481. Slow Light: Science and Applications; Boca Raton, FL: CRC Press, Taylor and Francis Group, 2008. p. 173-191. Chinese Journal of Scientific Instrument. 2007. Vol. 28, num. 3, p. 431-6. A. Vedadi; D. Alasia; E. Lantz; H. Maillotte; L. Thévenaz et al. IEEE Photonics Technology Letters. 2007. Vol. 19, num. 3, p. 179-81. Optics Express. 2007. Vol. 15, num. 17, p. 10814-10821. J.-C. Beugnot; T. Sylvestre; D. Alasia; H. Maillotte; V. Laude et al. Optics Express. 2007. Vol. 15, num. 23, p. 15517-15522. Integrated Photonics and Nanophotonics Research and Applications / Slow and Fast Light. 2007. Slow and Fast Light , Salt Lake City, Utah , July 8, 2007. p. SWC5. Integrated Photonics and Nanophotonics Research and Applications / Slow and Fast Light. 2007. Integrated Photonics and Nanophotonics Research and Applications , Salt Lake City, Utah , July 8, 2007. p. JTuA8. 33rd European Conference and Exhibition on Optical Communication - ECOC 2007. 2007. 33rd European Conference and Exhibition on Optical Communication - ECOC 2007 , Berlin, Germany , September 16-20, 2007. p. paper 10.1.2. Abstracts Book of the 6th International Conference on Tunable Diode Laser Spectroscopy. 2007. 6th International Conference on Tunable Diode Laser Spectroscopy, TDLS'07 , Reims, France , July 9-13, 2007. p. 56. Abstracts Book of the 6th International Conference on Tunable Diode Laser Spectroscopy. 2007. 6th International Conference on Tunable Diode Laser Spectroscopy, TDLS'07 , Reims, France , July 9-13, 2007. p. 97. J.-C. Beugnot; T. Sylvestre; H. Maillotte; V. Laude; N. Traynor et al. OFMC technical digest. 2007. 8th Optical Fiber Measurement Conference , Teddington, UK , Oct. 15-17, 2007. p. 5-8. IEEE International Symposium on Intelligent Signal Processing. WISP 2007. . 2007. p. 1-6. Third European Workshop on Optical Fibre Sensors, Proc. SPIE. 2007. Third European Workshop on Optical Fibre Sensors , Napoli, Italy , July 04, 2007. p. 661937-4. Third European Workshop on Optical Fibre Sensors. 2007. Napoli, Italy . p. 661938. European Conference on Lasers and Electro-Optics, 2007 and the International Quantum Electronics Conference. CLEOE-IQEC 2007.. 2007. The European Conference on Lasers and Electro-Optics , Munich, Germany , June 17-22, 2007. p. CD9-4. Optics Letters. 2006. Vol. 31, num. 6, p. 715-717. Optics Express. 2006. Vol. 14, num. 13, p. 5860-5865. Infrared Physics and Technology. 2006. Vol. 48, num. 2, p. 154-162. Applied Physics B: Lasers and Optics. 2006. Vol. 82, num. 2 SPEC ISS, p. 319-329. M. Mattiello; M. Nikles; S. Schilt; L. Thévenaz; A. Salhi et al. Spectrochimica Acta - Part A: Molecular and Biomolecular Spectroscopy. 2006. Vol. 63, num. 5, p. 952-958. R. Matthey; S. Schilt; D. Werner; C. Affolderbach; L. Thévenaz et al. Applied Physics B: Lasers and Optics. 2006. Vol. 85, num. 2-3, p. 477-485. Optics Express. 2006. Vol. 14, num. 4, p. 1395-1400. Optics Express. 2006. Vol. 14, num. 22, p. 10684-10692. Spectrochimica Acta - Part A: Molecular and Biomolecular Spectroscopy. 2006. Vol. 63, num. 5, p. 899-904. J. P. Besson; S. Schilt; F. Sauser; E. Rochat; P. Hamel et al. Applied Physics B: Lasers and Optics. 2006. Vol. 85, num. 2-3, p. 343-348. Applied Physics B: Lasers and Optics. 2006. Vol. 85, num. 2-3, p. 323-328. Measurement Science and Technology. 2006. Vol. 17, num. 5, p. 1091-1094. J. S. Selker; L. Thévenaz; H. Huwald; A. Mallet; W. Luxemburg et al. Water Resources Research. 2006. Vol. 42, num. 12, p. W12202. R. Matthey; C. Affolderbach; G. Mileti; S. Schilt; D. Werner et al. ICSO Proceedings. 2006. ICSO - 6th International Conference on Space Optics , Noordwijk, The Netherlands , June 27-30, 2006. Recueil des communications des 25e Journées Nationales d'Optique Guidée (JNOG). 2006. 25e Journées Nationales d'Optique Guidée (JNOG) , Metz, France , November 7-9, 2006. p. 149-151. Recueil des communications des 25e Journées Nationales d'Optique Guidée (JNOG). 2006. 25e Journées Nationales d'Optique Guidée (JNOG) , Metz, France , November 7-9, 2006. p. 250-252. Conference on Lasers and Electro-Optics/Quantum Electronics and Laser Science Conference and Photonic Applications Systems Technologies. 2006. Conference on Lasers and Electro-Optics , Long Beach, California United States , May 21, 2006. p. CPDA9. Slow and Fast Light. 2006. Slow and Fast Light , Washington, DC , July 23, 2006. p. TuB4. J.-P. Besson; S. Schilt; F. Sauser; E. Rochat; P. Hamel et al. OSA Technical Digest (CD). 2006. Optical Fiber Sensors , Cancun, Mexico , October 23, 2006. p. WB8. Optical Fiber Sensors. 2006. Optical Fiber Sensors , Cancun, Mexico , October 23, 2006. p. TuC1. Optical Fiber Sensors. 2006. Optical Fiber Sensors , Cancun, Mexico , October 23, 2006. p. ThC1. European Conference on Optical Communications. 2006. 32nd European Conference on Optical Communications - (ECOC 2006) , Cannes, France , September 24 - 28, 2006. p. 1-2. 2006 European Conference on Optical Communications. 2006. 32nd European Conference on Optical Communications - (ECOC 2006) , Cannes, France , Sept 24-28, 2006. p. 1-2. 2006 IEEE LEOS Annual Meeting Conference Proceedings. 2006. 2006 IEEE LEOS Annual Meeting , Montreal, QC, Canada , 29 October - 2 November 2006. p. 18-19. OFC/NFOEC 2006. 2006 Optical Fiber Communication Conference and National Fiber Optic Engineers Conference. 2006. Optical Fiber Communication Conference, 2006 and the 2006 National Fiber Optic Engineers Conference. OFC 2006 , Anaheim, CA , 5-10 March 2006. p. Paper OTuA2. Proceedings of the 2005 Conference on Lasers and Electro-Optics. 2006. 2005 Conference on Lasers and Electro-Optics (CLEO) , Baltimore, USA , 2005. p. 110-112. Opto & Laser Europe. 2006. num. 139, p. 27-9. Journal of the Korean Society for Nondestructive Testing. 2005. Vol. 25, num. 6, p. 421-430. Journal of Lightwave Technology. 2005. Vol. 23, num. 12, p. 4140-4146. Optics Express. 2005. Vol. 13, num. 24, p. 9758-9765. Optics Express. 2005. Vol. 13, num. 1, p. 82-88. Optics Letters. 2005. Vol. 30, num. 14, p. 1782-1784. Journal De Physique Iv. 2005. Vol. 125, p. 7-10. Measurement Science & Technology. 2005. Vol. 16, num. 4, p. 900-8. Applied Physics Letters. 2005. Vol. 87, num. 8, p. 081113. Nonlinear Guided Waves and Their Applications. 2005. Nonlinear Guided Waves and Their Applications , Dresden, Germany , 2005. p. WC3. Frontiers in Optics. 2005. Frontiers in Optics , Tucson, Arizona , 2005. p. LWB2. S. Schilt; D. Werner; L. Thévenaz; R. Matthey; C. Affolderbach et al. Abstracts Book of the 5th International Conference on Tunable Diode Laser Spectroscopy. 2005. 5th International Conference on Tunable Diode Laser Spectroscopy, TDLS'05 , Florence, Italy , July 11-15, 2005. p. 62. M. Mattiello; M. Nikles; S. Schilt; L. Thévenaz; A. Sahli et al. Abstracts Book of the 5th International Conference on Tunable Diode Laser Spectroscopy. 2005. 5th International Conference on Tunable Diode Laser Spectroscopy, TDLS'05 , Florence, Italy , July 11-15, 2005. p. 131. Abstracts Book of the 5th International Conference on Tunable Diode Laser Spectroscopy. 2005. 5th International Conference on Tunable Diode Laser Spectroscopy, TDLS'05 , Florence, Italy , July 11-15, 2005. p. 90. 31st European Conference on Optical Communication. 2005. p. 7-8. 17th International Conference on Optical Fibre Sensors. 2005. p. 142-145. 17th International Conference on Optical Fibre Sensors. 2005. p. 968-971. 2005 Conference on Lasers and Electro-Optics (CLEO). 2005. Conference on Lasers and Electro-Optics , Baltimore, Maryland , 22-27 May 2005. p. 1215-1217. 13th International Conference on Photoacoustic and Photothermal Phenomena. 2005. Rio de Janeiro, Brazil . p. 7-10. 2005 Conference on Lasers and Electro-Optics Europe. 2005. p. 462. 17th International Conference on Optical Fibre Sensors. 2005. p. 415-418. 17th International Conference on Optical Fibre Sensors. 2005. p. 587-590. 17th International Conference on Optical Fibre Sensors. 2005. p. 180-183. Proceedings of the SPIE. 2005. Opto-Ireland 2005: Nanotechnology and Nanophotonics , Dublin, Ireland , 2005. p. 13-22. Encyclopedia of Modern Optics; Oxford: Elsevier, 2005. p. 432-440. Measurement Science and Technology. 2004. Vol. 15, num. 8, p. 1519-1524. S. Schilt; A. Vicet; R. Werner; M. Mattiello; L. Thévenaz et al. Spectrochimica Acta - Part A: Molecular and Biomolecular Spectroscopy. 2004. Vol. 60, num. 14, p. 3431-3436. Spectrochimica Acta - Part A: Molecular and Biomolecular Spectroscopy. 2004. Vol. 60, num. 14, p. 3259-3268. Applied Optics. 2004. Vol. 43, num. 22, p. 4446-53. IEEE Photonics Technology Letters. 2004. Vol. 16, num. 4, p. 1128-1130. Spectrochimica Acta - Part A: Molecular and Biomolecular Spectroscopy. 2004. Vol. 60, num. 14, p. 3449-3456. Measurement Science and Technology. 2004. Vol. 15, num. 8, p. 1525-1530. D. Werner; S. Schilt; L. Thévenaz; G. Mileti; C. Affolderbach et al. DGaO-Proceedings 105. Tagung. 2004. 105. Tagung der Deutschen Gesellschaft für angewandte Optik , Bad Kreuznach, Germany , June 2-5, 2004. p. P51. 4. Konferenz über Optische Analysenmesstechnik in Industrie und Umwelt (OPTAM’04). 2004. 4. Konferenz über Optische Analysenmesstechnik in Industrie und Umwelt (OPTAM’04) , Düsseldorf, Germany , October 7-8, 2004. p. 99-106. 4. Konferenz über Optische Analysenmesstechnik in Industrie und Umwelt (OPTAM’04). 2004. 4. Konferenz über Optische Analysenmesstechnik in Industrie und Umwelt (OPTAM’04) , Düsseldorf, Germany , October 7-8, 2004. p. 189-196. Second European Workshop on Optical Fibre Sensors. 2004. Santander, Spain . p. 556-559. Second European Workshop on Optical Fibre Sensors. 2004. p. 317-320. Second European Workshop on Optical Fibre Sensors. 2004. Santander, Spain . p. 468-471. SPS Swiss physical society Annual meeting. 2004. Journal of Lightwave Technology. 2003. Vol. 21, num. 2, p. 546-554. Applied Optics. 2003. Vol. 42, num. 33, p. 6728-38. Journal of Modern Optics. 2003. Vol. 50, num. 8, p. 1189-1194. Optics Letters. 2003. Vol. 28, num. 22, p. 2210-2212. Optical Engineering. 2003. Vol. 42, num. 3, p. 662-669. Technical Digest OFS-16. 2003. 16th International Conference on Optical Fiber Sensors , Nara, Japan , October 13-17, 2003. p. 312-315. Technical Digest OFS-16. 2003. 16th International Conference on Optical Fiber Sensors , Nara, Japan , October 13-17, 2003. p. 506-509. Technical Digest OFS-16. 2003. 16th International Conference on Optical Fiber Sensors , Nara, Japan , October 13-17, 2003. p. 286-289. Technical Digest OFS-16. 2003. 16th International Conference on Optical Fiber Sensors , Nara, Japan , October 13-17, 2003. p. 280-284. Technical Digest OFS-16. 2003. 16th International Conference on Optical Fiber Sensors , Nara, Japan , October 13-17, 2003. p. 38-41. S. Schilt; L. Thévenaz; A. Vicet; A. Perona; P. Grech et al. Abstracts Book of the 4th International Conference on Tunable Diode Laser Spectroscopy. 2003. 4th International Conference on Tunable Diode Laser Spectroscopy, TDLS-2003 , Zermatt, Switzerland , July 12-18, 2003. p. 70. Abstracts Book of the 4th International Conference on Tunable Diode Laser Spectroscopy. 2003. 4th International Conference on Tunable Diode Laser Spectroscopy, TDLS-2003 , Zermatt, Switzerland , July 12-18, 2003. p. 52. Abstracts Book of the 4th International Conference on Tunable Diode Laser Spectroscopy. 2003. 4th International Conference on Tunable Diode Laser Spectroscopy, TDLS-2003 , Zermatt, Switzerland , July 12-18, 2003. p. 13. Optical Fiber Communications Conference, 2003. OFC 2003. 2003. Optical Fiber Communications Conference, 2003. OFC 2003 , Atlanta, Georgia United States , 23-28 March 2003. p. 714-716 paper FK3. Proceedings of TRANSDUCERS '03. 2003. TRANSDUCERS '03. 12th International Conference on Solid-State Sensors, Actuators and Microsystems. , Boston, USA , 8-12 June 2003. p. 1490-3. Spectrochimica Acta - Part A: Molecular and Biomolecular Spectroscopy. 2002. Vol. 58, num. 11, p. 2533-2539. L. Thévenaz; A. Fellay; M. Facchini; W. Scandale; M. Nikles et al. Smart Structures and Materials 2002: Smart Sensor Technology and Measurement Systems. 2002. p. 22-27. A. Fellay; L. Thévenaz; J. P. Garcia; M. Facchini; W. Scandale et al. 15th Optical Fiber Sensors Conference Technical Digest. OFS 2002. 2002. Portland, OR, USA . p. 301-4. 15th Optical Fiber Sensors Conference Technical Digest. OFS 2002. 2002. Portland, OR, USA . p. 313-16. 15th Optical Fiber Sensors Conference Technical Digest. OFS 2002. 2002. Portland, OR, USA . p. 607-611. P. Dainesi; A. M. Ionescu; L. Thévenaz; K. Banerjee; M. J. Declercq et al. Proceedings of IEEE International Solid-State Circuits Conference (ISCC). 2002. IEEE International Solid-State Circuits Conference (ISCC) , San Francisco, CA , 3-7 Feb. 2002. p. 360-361. Applied Physics B: Lasers and Optics. 2001. Vol. 73, num. 5-6, p. 475-478. 4th Pacific Rim Conference on Lasers and Electro-Optics CLEO/Pacific Rim 2001. 2001. Chiba, Japan . p. 490-491. Proceedings 27th European Conference on Optical Communication (Cat. No.01TH8551). 2001. 27th European Conference on Optical Communication , Amsterdam, Netherlands . p. 132-133. P. Dainesi; L. Thévenaz; P. Fluckiger; C. Hibert; G. Racine et al. Proceedings of IEEE International SOI Conference, 2001. 2001. IEEE International SOI Conference, 2001 , Durango, CO, USA , 1-4 Oct. 2001. p. 137-138. IEICE Transactions on Electronics. 2000. Vol. E83-C, num. 3, p. 331-335. 2000. Trends in Optical Non-destructive Testing , Lugano, Switzerland , June 3-5, 2000. 14th International Conference on Optical Fiber Sensors. 2000. p. 344-347. Optics Letters. 1999. Vol. 24, num. 21, p. 1493-1495. Journal of Lightwave Technology. 1999. Vol. 17, num. 4, p. 629-636. IEEE Journal of Quantum Electronics. 1999. Vol. 35, num. 1, p. 32-8. Proceeding of the 5th Optical Fibre Measurement Conference. 1999. 5th Optical Fibre Measurement Conference OFMC'99 , Nantes, France , 22-24 September 1999. p. 110-113. Proceeding of the 5th Optical Fibre Measurement Conference. 1999. 5th Optical Fibre Measurement Conference OFMC'99 , Nantes, France , 22-24 September 1999. p. 106-109. L. Thévenaz; M. Facchini; A. Fellay; P. Robert; D. Inaudi et al. 13th International Conference on Optical Fiber Sensors. 1999. 13th International Conference on Optical Fiber Sensors , Kyongju, South Korea , April 12-16, 1999. p. 345-348. 13th International Conference on Optical Fiber Sensors. 1999. 13th International Conference on Optical Fiber Sensors , Kyongju, South Korea , April 12-16, 1999. p. 82-85. 13th International Conference on Optical Fiber Sensors. 1999. 13th International Conference on Optical Fiber Sensors , Kyongju, South Korea , April 12-16, 1999. p. 374-377. D. G. Uttamchandani; A. Sass; B. Culshaw; M. S. Overington; M. Parsey et al. International Conference on Fiber Optics and Photonics: Selected Papers from Photonics India '98. 1999. International Conference on Fiber Optics and Photonics: Selected Papers from Photonics India '98 , New Delhi, India , April 28, 1999. p. 514-519. D. G. Uttamchandani; B. Culshaw; M. S. Overington; M. Parsey; M. Facchini et al. Fiber Optic Sensor Technology and Applications. 1999. p. 273-275. D. Uttamchandani; B. Culshaw; M. S. Overington; M. Parsey; M. Facchini et al. 13th International Conference on Optical Fiber Sensors. 1999. 13th International Conference on Optical Fiber Sensors , Kyongju, South Korea , April 12-16, 1999. p. 8-11. CLEO/Europe 1998. Conference on Lasers and Electro-Optics Europe.. 1998. p. 281. OFC '98. Optical Fiber Communication Conference and Exhibit. Technical Digest. Conference Edition. 1998 OSA Technical Digest Series Vol.2 (IEEE Cat. No.98CH36177). 1998. OFC '98 Optical Fiber Communication Conference and Exhibit. Technical Digest Conference Edition 1998 OSA Technical Digest Series. Vol.2 , San Jose, CA, USA , February 22, 1998. p. 253-254.
International Conference on Applied Optical Metrology. 1998. p. 374-381. Smart Structures and Materials 1998: Sensory Phenomena and Measurement Instrumentation for Smart Structures and Materials. 1998. p. 301-314. Journal of Lightwave Technology. 1997. Vol. 15, num. 10, p. 1842-1851. Journal of Lightwave Technology. 1997. Vol. 15, num. 6, p. 977-982. IEEE Photonics Technology Letters. 1997. Vol. 9, num. 7, p. 973-5. Optics Letters. 1997. Vol. 22, num. 2, p. 90-92. M. Nikles; L. Thévenaz; A. Fellay; M. Facchini; P. Robert et al. Proceedings of 46th International Wire and Cable Symposium. 1997. International Wire and Cable Symposium IWCS'97 , Philadelphia PA, USA , November 17-20, 1997. p. 658-664. Conference Digest OFMC '97. 1997. Optical Fibre Measurement Conference OFMC'97 , Teddington, UK , Spet.29-Oct. 1, 1997. p. 82-85. 12th International Conference on Optical Fiber Sensors. 1997. Optical Fiber Sensors , Williamsburg, Virginia , October 28, 1997. p. OWD3. Optics Letters. 1996. Vol. 21, num. 10, p. 758-60. Technical Digest - Symposium on Optical Fiber Measurements, 1996. 1996. Symposium on Optical Fiber Measurements , Boulder, CO, USA , October 1-3, 1996. p. 111-114. ECOC '96. 22nd European Conference on Optical Communication. 1996. 22nd European Conference on Optical Communication ECOC '96 , Oslo, Norway , September 15-19.1996. p. 305-308. Optical Engineering. 1995. Vol. 34, num. 7, p. 2078-83. 3rd Optical Fibre Measurement Conference (OFMC '95). 1995. 3rd Optical Fibre Measurement Conference OFMC '95 , Liège, Belgium , Sepètember 25-26, 1995. p. VII-2. Measurement Science & Technology. 1994. Vol. 5, num. 9, p. 1124-1130. Electronics Letters. 1994. Vol. 30, num. 18, p. 1488-1489. Recueil des Communications. 1994. Colloque Optique Guidée et Photonique 3,, 62e Congrès de l’Association Canadienne-Française pour l’Avancement des Sciences (ACFAS) , Montréal, Canada , May 18-19, 1994. p. 59-69. Technical Digest Symposium on Optical Fiber Measurements. 1994. Symposium on Optical Fiber Measurements , Boulder CO, USA , September 13-15, 1994. p. 211-214. Summaries of papers presented at the "COST Workshop 94" Optical Telecommunications. 1994. COST Workshop 94 Optical Telecommunications , Nice, France , April 17-21, 1994. p. 295-298. Proc. SPIE. 1994. Tenth International Conference on Optical Fibre Sensors , Glasgow, United Kingdom , September 14, 1994. p. 138-141. Conference on Optical Fiber Communication. 1994. Optical Fiber Communication Conference , San Jose, California United States , February 20, 1994. p. 89-90 Paper WF1. AGEN-Mitteilungen. 1993. Vol. 56-57, p. 55-57. IEEE Photonics Technology Letters. 1993. Vol. 5, num. 3, p. 365-7. Nonlinear Guided-Wave Phenomena Technical Digest. 1993. Third Topical Meeting on Nonlinear Guided-Wave Phenomena , Cambridge, UK , September 19-22, 1993. p. 92-95. S. Y. Huang; K. Toyama; P. A. Nicati; L. Thévenaz; B. Y. Kim et al. Fiber Optic and Laser Sensors X. 1993. p. 48-59. Mitteilungen AGEN. 1992. Vol. 55, p. 55-60. Technical Digest Symposium on Optical Fiber Measurements. 1992. Symposium on Optical Fiber Measurement , Boulder, CO, USA , September 15-17, 1992. p. 151-154. Mitteilungen AGEN. 1991. Vol. 54, p. 5-9.
International Microwave Conference SBMO'91. 1991. International Microwave Conference SBMO'91 , Rio de Janeiro, Brazil , July 22-25, 1991. p. Paper 01.2. EFOC/LAN'91 Proceedings. 1991. Ninth Annual European Fibre Optic Communications and Local Area Network Conference EFOC/LAN 91 , Regent's College, London, UK , June 19-21, 1991. p. 156-158. EFOC/LAN'91 Proceedings. 1991. Ninth Annual European Fibre Optic Communications and Local Area Network Conference EFOC/LAN 91 , London, UK , June 19-21, 1991. p. 150-155. IOOC-ECOC '91. 17th European Conference on Optical Communication and 8th International Conference on Integrated Optics and Optical Fibre Communication. 1991. 17th European Conference on Optical Communication and 8th International Conference on Integrated Optics and Optical Fibre Communication (IOOC-ECOC '91) , Paris, France , September 9-12, 1991. p. 533-536. L. Thévenaz; M. Niklès; J.-P. Pellaux; B. Desormière; P. Robert et al. JNOG'90 Recueil des Communications. 1990. 11e Journées Nationales d'Optique Guidée (JNOG'90) , Grenoble, France , October 17-19, 1990. p. 123-125. Proc. SPIE. 1990. Interferometry '89 , Warsaw, Poland , May 08, 1989. p. 306-311. ECOC 90. 16th European Conference on Optical Communication. 1990. 16th European Conference on Optical Communication ECOC 90 , Amsterdam, Netherlands , 16-20 September 1990. p. 581-584. Journal of Lightwave Technology. 1989. Vol. 7, num. 8, p. 1207-1212. EFOC/LAN'89 Technical Digest. 1989. Seventh European Fibre Optic Communications and Local Area Networks EFOC/LAN'89 , Amsterdam, Netherlands , June 14-16, 1989. p. 217-220. Journal of Lightwave Technology. 1988. Vol. 6, num. 1, p. 1-7. Journal of Lightwave Technology. 1988. Vol. 6, num. 10, p. 1470-1475. Optical Fiber Communication Conference, 1988 Technical Digest Series. 1988. Optical Fiber Communication Conference , New Orleans, Louisiana, USA , 1988. p. 86. Electronics Letters. 1987. Vol. 23, num. 4, p. 151-152. Electronics Letters. 1987. Vol. 23, num. 20, p. 1078-1079. Optics Letters. 1987. Vol. 12, num. 8, p. 619-21. ECOC'87 Technical Digest. 1987. 13th European Conference on Optical Communication (ECOC'1987) , Helsinki, Finland , September 13-17, 1987. p. 205-208.